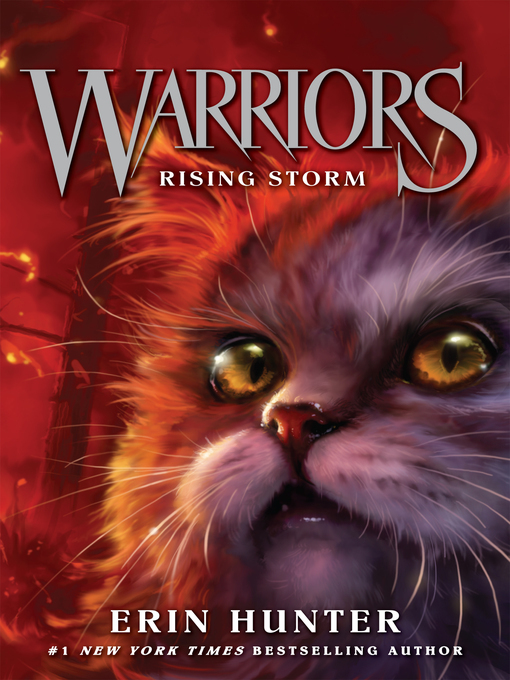 Join the legion of fans who have made Erin Hunter's Warriors series a bestselling phenomenon. 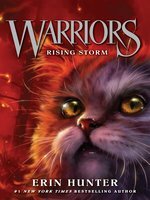 More thrilling adventures, epic action, and fierce warrior cats await in Warriors #4: Rising Storm. Fireheart's traitorous enemy Tigerclaw has been vanquished and exiled from ThunderClan—but Fireheart can't shake the feeling that he is lurking in the forest, waiting for a chance to strike. Warm shafts of sun shine streamed through the canopy of leaves and flickered over Fireheart's pelt. He crouched lower, aware that his coat would be glowing amber among the lush green undergrowth. Paw by paw, he crept beneath a fern. He could smell a pigeon. He moved slowly toward the mouth watering scent until he could see the plump bird pecking among the ferns. Fireheart flexed his claws, his paws itching with anticipation. He was hungry after leading the dawn patrol and hunting all morning. This was the high season for prey, a time for the Clan to grow fat on the forest's bounty. And although there had been little rain since the new leaf floods, the woods were rich with food. After stocking the fresh-kill pile back at camp, it was time for Fireheart to hunt for himself. He tensed his muscles, ready to leap. Suddenly a second scent wafted toward him on the dry breeze. Fireheart opened his mouth, tipping his head to one side. The pigeon must have smelled it too, for its head shot up and it began to unfold its wings, but it was too late. A rush of white fur shot out from under some brambles. Fireheart stared in surprise as the cat pounced on the startled bird, pinning it to the ground with his front paws before finishing it off with a swift bite to the neck. The delicious smell of fresh-kill filled Fireheart's nostrils. He stood up and padded out of the undergrowth toward the fluffy white tom. "Well caught, Cloudpaw," he meowed. "I didn't see you coming until it was too late." "Nor did this stupid bird," crowed Cloudpaw, flicking his tail smugly. Fireheart felt his shoulders tense. Cloudpaw was his apprentice as well as his sister's son. It was Fireheart's responsibility to teach him the skills of a Clan warrior, and how to respect the warrior code. The young tom was undeniably a good hunter, but Fireheart couldn't help wishing that he would learn a little humility. Deep down, he sometimes wondered if Cloudpaw would ever understand the importance of the warrior code, the moons-old traditions of loyalty and ritual that had been passed down through generations of cats in the forest. But Cloudpaw had been born in Twolegplace to Fireheart's kittypet sister, Princess, and brought to ThunderClan by Fireheart as a tiny kit. Fireheart knew from his own bitter experience that Clan cats had no respect for kittypets. Fireheart had spent his first six moons living with Twolegs, and there were cats in his Clan that would never let him forget the fact that he was not forest-born. He twitched his ears impatiently. He knew he did everything he could to prove his loyalty to the Clan, but his stubborn apprentice was a different matter. If Cloudpaw were going to win any sympathy from his Clan mates, he was going to have to lose some of his arrogance. "It's just as well you're so quick," Fireheart pointed out. "You were upwind. I could smell you, even if I couldn't see you. And so could the bird." Cloudpaw's long snowy fur bristled and he snapped back, "I know I was upwind! But I could tell this dumb dove wasn't going to be hard to catch whether he smelled me or not." The young cat stared defiantly into Fireheart's eyes, and Fireheart felt his annoyance turning to anger. "It's a pigeon, not a dove!" he spat. "And a true warrior shows more respect for the prey that feeds his Clan." "Yeah, right!" retorted Cloudpaw. "I didn't see Thornpaw show much respect for that squirrel he dragged back to camp yesterday. He said it was so dopey, a kit could have caught it." "Thornpaw is just an apprentice," Fireheart growled. "Like you, he still has a lot to learn." "Well, I caught it, didn't I?" grumbled Cloudpaw, prodding the pigeon with a sullen paw. cormac - I do not like cats, but when my best friend who loved the series was reading it and recommended it to me I tried it and now I can't stop reading it! It is a good book for people who like adventure books. In conclusion, READ THIS BOOK! ALA Booklist "A good, suspenseful adventure story that urges readers onward." Publishers Weekly "Certain to please any young reader who has ever wondered what dreams of grandeur may haunt the family cat." Voice of Youth Advocates (VOYA) "[A] fast-moving series. The story is suspenseful; the feline characters are engaging and endowed with authentic cat mannerisms and behaviors."